Before the occupation of the refuge in Oregon, before the siege at Waco, before Oklahoma City, there was Ruby Ridge. Twenty-five years later, the same question remains: How could this have happened? Shortly before dawn on August 21, 1992, six U.S. Marshals hiked up the steep ridge near the isolated mountaintop cabin of white separatist Randy Weaver in Northern Idaho. Charged with selling two illegal sawed-off shotguns to an undercover agent more than a year earlier, Weaver had failed to appear in court, instead holing up in his cabin with his wife Vicki, three children and a cache of firearms. Growing increasingly frustrated by Weaver’s defiance, the marshals had intensified their surveillance and strayed ever closer to the cabin itself. On the morning of the 21st, a firefight broke out. Eleven days later, the standoff that mesmerized the nation would leave Weaver injured, his wife and son, and a federal agent, dead, and many convinced that the federal government was out of control. Drawing upon eyewitness accounts, including interviews with Weaver’s daughter and federal agents involved in the confrontation, “Ruby Ridge” is a riveting, minute-by-minute account of the event that helped give rise to the modern American militia movement. Directed by Barak Goodman and executive produced by Mark Samels, “Ruby Ridge” premieres on American Experience Tuesday, February 14, 2017, 8 p.m. CT on OETA-HD. Randy and Vicki Weaver’s story begins in Iowa during the farm crisis of the late 1970s. Spurred by economic insecurity and an apocalyptic religious vision, Weaver, a former Green Beret, moved his family to a remote area of Northern Idaho, 50 miles from the Canadian border. On a mountaintop they called “Ruby Ridge,” the Weavers built the sanctuary they were seeking — a cabin with no electricity, running water or indoor plumbing. There, they could grow their own food, home school their children and escape what they viewed as a corrupt country run by a godless federal government. Seeking fellowship, the Weavers began attending the annual summer congresses of the Aryan Nations, a white supremacist organization 60 miles away in Hayden Lakes, Idaho. Unbeknownst to the Weavers, federal law enforcement had the Aryan Nations under surveillance after a radical offshoot of the group, led by Robert Matthews, had engaged in a slew of crimes including the murder of Alan Berg, a Jewish talk show host in Denver. While attending an Aryan Nations congress, Randy Weaver was approached and befriended by an informant of the Bureau of Alcohol, Tobacco and Firearms. In a classic sting operation, the informant offered to pay Weaver to saw the barrels off two shotguns. Short of money, Weaver agreed. In June 1990, federal agents offered Weaver a deal: cooperate with the government as an informant or face arrest on gun charges. Weaver was also told, mistakenly, that if he lost his case in court, he’d lose his home. His hatred of the federal government now fully galvanized, Weaver refused the deal and subsequently failed to show up for his court hearing. He retreated to his cabin, which had been made ready for a long siege with stocks of food, water and ammunition. For more than a year, the U.S. Marshals Service tried to wait Weaver out. But in the spring of 1992, they decided to press the situation, installing surveillance cameras around the Weavers’ cabin. Video footage of the family showed that they were nearly always armed, including the children. 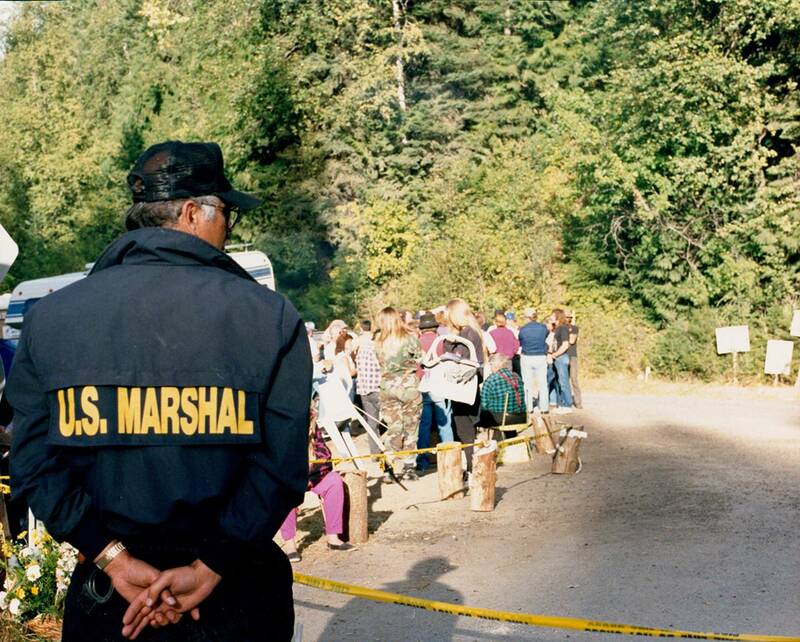 On the morning of August 21, 1992, six marshals headed up the mountain to gather additional intelligence. When the Weavers’ dog began barking, Randy, his son Sam and family friend Kevin Harris decided to investigate, accidentally crossing paths with the marshals. Shots were fired, and 14-year-old Sam Weaver and Marshal William Degan were killed. With a dead federal agent, jurisdiction over the case now passed to the FBI, which went into full gear. Believing they were deploying into an ongoing firefight, the FBI’s elite Hostage Rescue Team brought in military-style equipment, surrounded the house with snipers and issued rules of engagement allowing them to fire on any armed adult without warning. News of the standoff soon spread. A roadblock was set up a mile away from the cabin where friends and supporters of the Weavers gathered, along with white supremacists and the national media. The next day, when Randy Weaver stepped out of the cabin, he was shot and wounded by snipers. Seconds later, while standing in the doorway of her home holding her infant daughter, Vicki Weaver was killed, the bullet passing through her body and into Kevin Harris. For days the family remained in the cabin. Sara Weaver, the 16-year-old daughter of Randy and Vicki, became the de facto matriarch. “We didn’t trust anybody for any kind of help, for anything,” she said. The siege continued for more than a week until Bo Gritz, a former Green Beret and hero of the radical right, showed up and offered his services as a third-party negotiator. Desperate to end the standoff, the FBI accepted. Gritz successfully coaxed Kevin Harris out of the cabin to get medical care, and after removing Vicki’s body, convinced Randy to come out with the children. The standoff was over, but Ruby Ridge had already become a lightning rod for the modern American militia movement. On April 22, 1993, Kevin Harris and Randy Weaver went on trial for first-degree murder in the death of U.S. Marshal William Degan. After the longest deliberations in Idaho history, both Weaver and Harris were acquitted. “Ruby Ridge” will be available on DVD from PBS Distribution and can be purchased at ShopPBS.org. Online viewing begins February 15 at PBS.org.